Borrow against your metals when you need it or lend fiat currency in a safe manner. Silver Bullion matches borrowers, using their metal as collateral, with lenders who have extra funds (fiat) and who want a return with minimal risk. IMPORTANT: Owners of metal cannot lend their assets, they can only borrow against it (we do not facilitate gold leasing). Choose the currency (SGD or USD) and duration (1, 6, 12 or 24 months) to lend or borrow. Then post via our platform how much you are willing to lend or borrow. When a lender and a borrower agree on the terms, a contract is created. The lender’s funds are secured at a 2:1 ratio by the borrower’s metals, stored within our fully controlled and owned vault: The Safe House. No middlemen are involved. Cases where a lender payment was delayed. Note: Should a borrower be late in repaying his/her debt, the Sweeper Fund will forward cash to ensure the lender is paid on time. The Sweeper Fund essentially acts as an additional buffer to help ensure timely payments. Find out more about the Sweeper Fund. Cases where a lender did not receive payment back. Note: Should a borrower be late in repaying his/her debt, the Sweeper Fund will forward cash to ensure the lender is paid on time. Essentially the Sweeper Fund will take on the bad debt to prevent delays or defaults. This provides times for the borrower to remedy the missed payment and, if need be, for the borrower collateral to be liquidated. View all past contracts in PDF or Excel format. 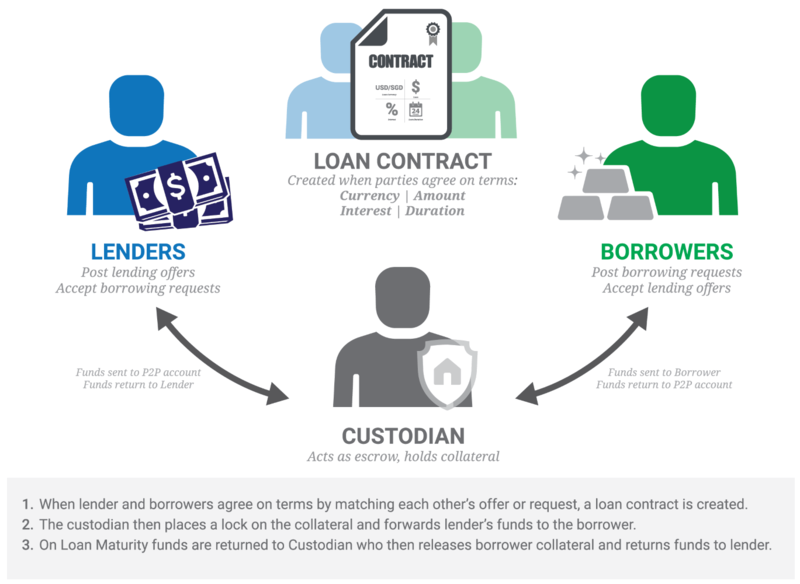 How collateralized peer-to-peer loans work. Open a S.T.A.R. Storage account (open account). The account is free to open and does not require the purchase of bullion. Once approved you will have the ability lend or borrow. To borrow either submit your own borrowing request or accept a lender's existing offer. You must have either purchased bulllion through us or transferred your bullion to our vault to borrow. To lend either submit your own lending offer or accept a borrower's existing request. You must have USD or SGD funds in your P2P Loan Account (see wire instructions) to be a lender. When lenders and borrowers match, a loan contract is created whose payout will occur on the earliest 1st, 8th, 15th and 22nd of the month. The next payout / loan start is 22 Apr 2019. Contracts can be in SGD or USD and have duration s of 1, 6, 12 or 24 months. On the loan start date, the custodian (Silver Bullion) forwards lender’s funds to the borrower and holds collateral. 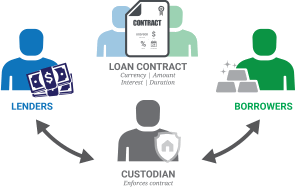 On loan maturity, funds are returned to custodian who then releases borrower collateral and returns funds to lender. More information on the details page.